Mr Lilian: It won’t be very early. My jaw kind of dropped when I heard that. 7:30am is very for us indulgent people. Still, we all have to cooperate so I woke up at 6:45am to pack my bags. Since yesterday’s post was about Lilian’s wedding, I need to tell you a bit about the hotel she put us up at. Lilian kindly booked us a room for the night since the dinner ceremony would end quite late. (7:30pm!) When she checked us in, she had to borrow someone else’s identity card because the little hotel cannot accept foreigners. I asked Lilian to explain why. She said that only certain hotels can accept foreigners since there would be major problems if the visitor faces problems (aka dies) while staying in the hotel. Since Lilian booked too many rooms, Nicole and I each had a room. 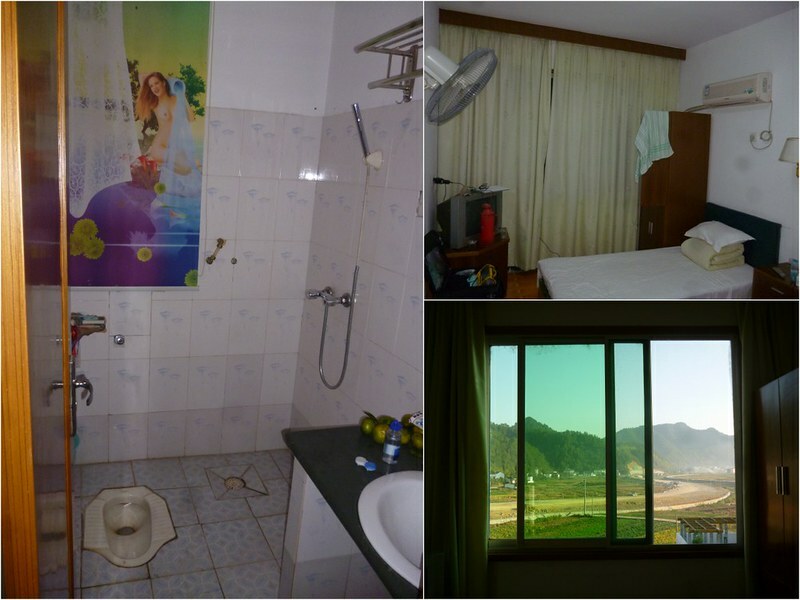 My room had 2 single beds and a view of the countryside. I didn’t get to see the countryside at night as it was too dark. I lit a mosquito coil during the night and kept the cutains closed. I felt faint from what could be the fumes that night. At least I didn’t died. All the guests had breakfast at an eatery nearby. There, Lilian introduced us to 米羹 (mi geng), a rice paste-like dish with some local chili sauce and preserved vegetable. She explained that the dish was made during war times when food was scarce. The villagers put together all the rice they have as well as the veggies. Out came this special dish. Other food served was a pancake with preserved vegetables (again!) and bits of meat. 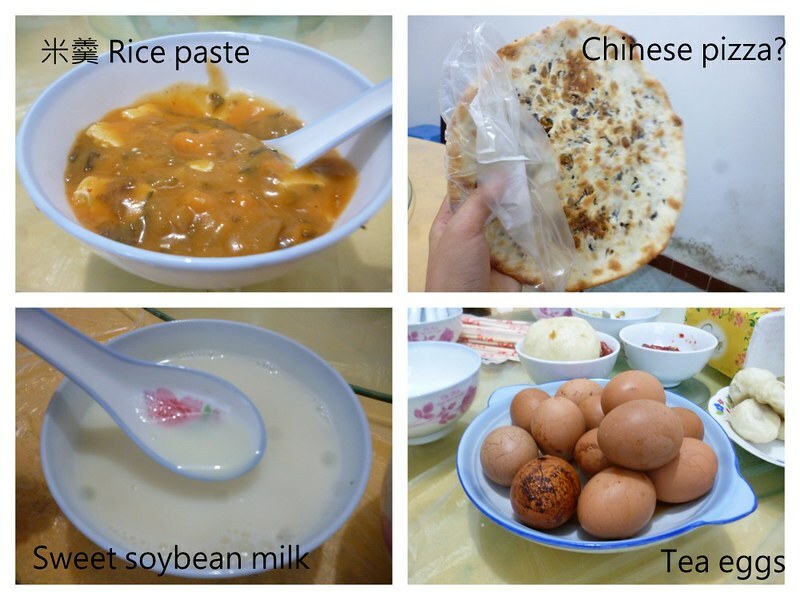 There was also sweet soy bean milk and runny, plain rice porridge as well as tea eggs (eggs boiled in tea). After breakfast, Nicole and I waited for the bus back to Qiandao Hu. We would need to catch the 13:50 bus to Shanghai. Lilian’s husband, Mr Lilian, was very helpful with the bus. He even ran across the street when the first bus at 9am came. Unfortunately, that bus was full so we had to wait for the 10am bus. Lilian was more anxious than us and asked if a local could drive us to Qiandao Hu. As the lady driver was getting ready, another bus came. Mr Lilian went to check if the bus was leaving soon. Turns out, it was the 10am bus but it came out earlier to pick up passengers and would leave early if there were enough passengers. So Nicole and I, as well as Lilian’s cousin, got on the 10am bus. We said farewell to the newlyweds and waited patiently for the bus to leave. Unfortunately, the bus didn’t fill up as fast as I hoped. In the end, the bus left as its usual timing. The road to Qiandao Hu was rocky. 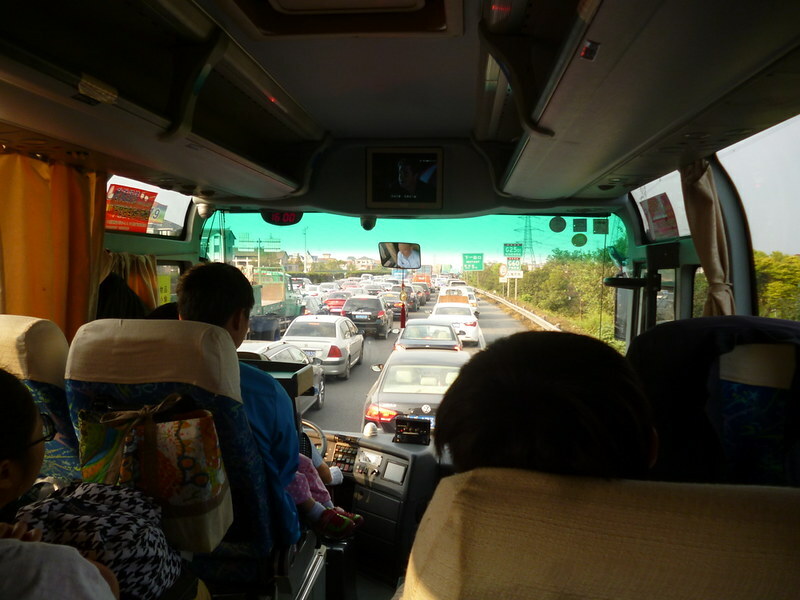 Even though I was napping throughout the 2-hour journey, I felt the bus sway from left to right. The driver even had to honk frequently on the narrow road. Let’s just fast forward to the Qiandao Hu bus station since the first bus journey was very boring. 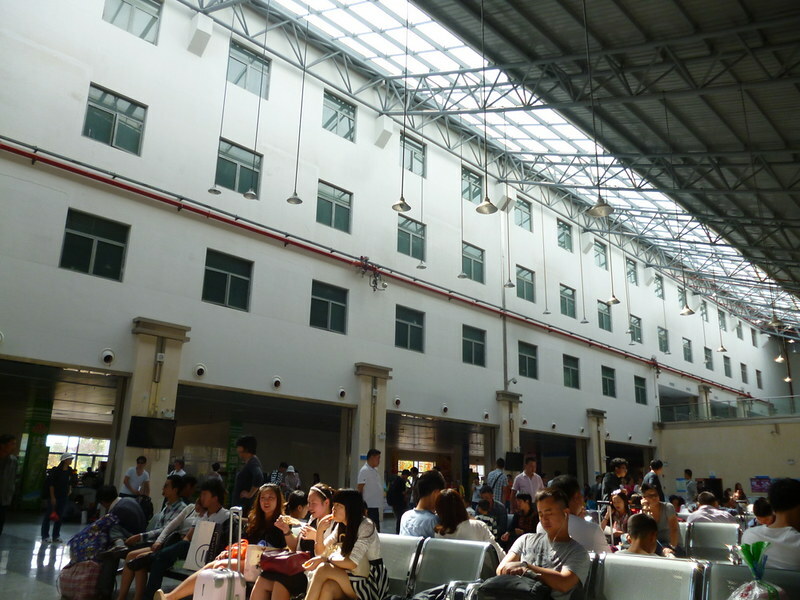 At the Qiandao Hu bus station, Lilian’s cousin sent us off until the waiting room. Nicole had to tell the cousin that we would be alright alone before she left. As we zipped through the highways to Shanghai, I was surprised at how developed China is. There were multiple high-raised roads (is that how you call them) and buildings on the side of the road either soared up high into the sky or were built in the strange format preferred by rich farmers. These strangely shaped houses are usually painted gray and are at least 3 storey high. They look like milk-boxes with roofs inspired by ancient Chinese roof tiles. 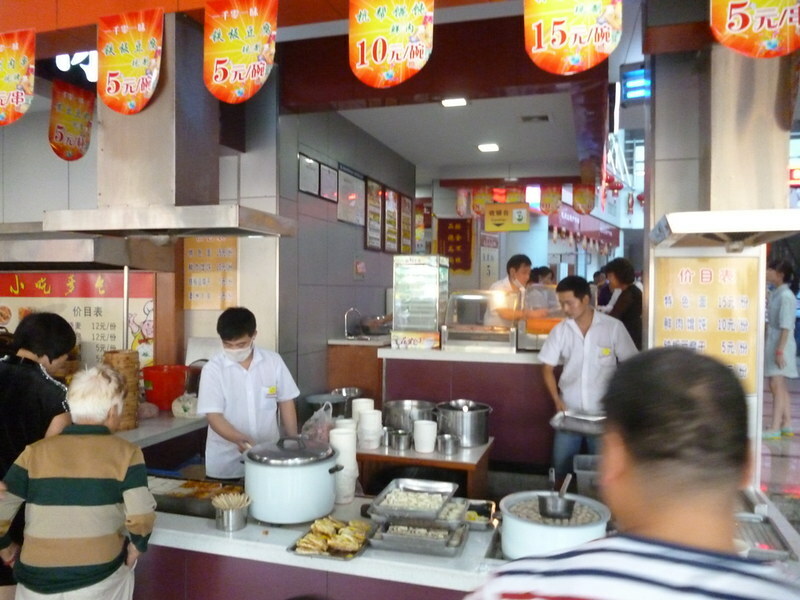 It gave an impression of a mix of the west and China but in a jarring way. At the beginning of the journey, I watched the very lame movie. It was about killer giant crocodiles. The movie was predictable so I napped in short bursts along the way. We stopped at a rest stop and the driver game us only 10 minutes. He warned everyone not to get instant noodles too. Unfortunately, we got back onto the bus late. The driver yelled at me in his extra loud voice: DO YOU WANT TO FIND YOUR OWN TRANSPORT TO SHANGHAI? We reached Shanghai sooner than I thought. We got off the bus at 6:30pm and took the metro to our hotel. 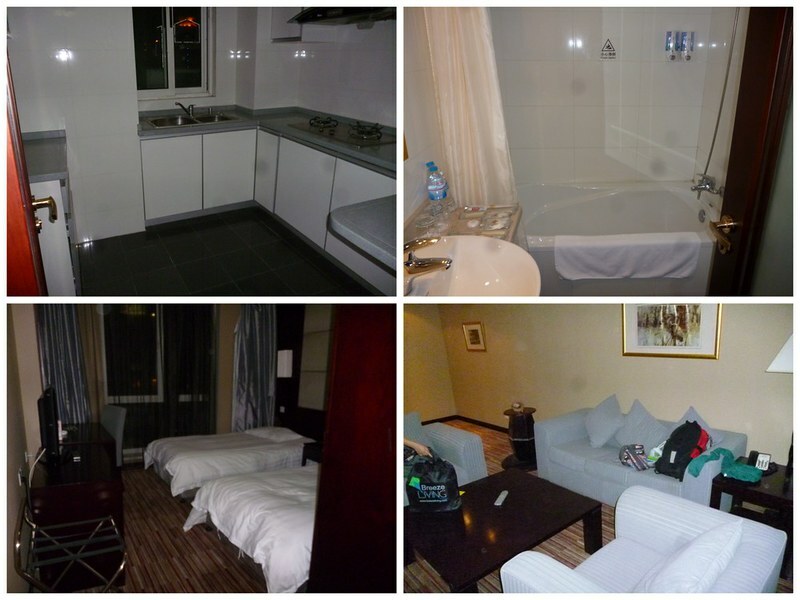 Our hotel room was upgraded to a suite because they ran out of double bed rooms. Then we went in search of food, stopping by Watson on the way. Since Costa Coffee had free WI-FI, Nicole and I holed ourselves up at the café to update our social networks. We also made reservations for a buffet lunch tomorrow. Cannot wait!